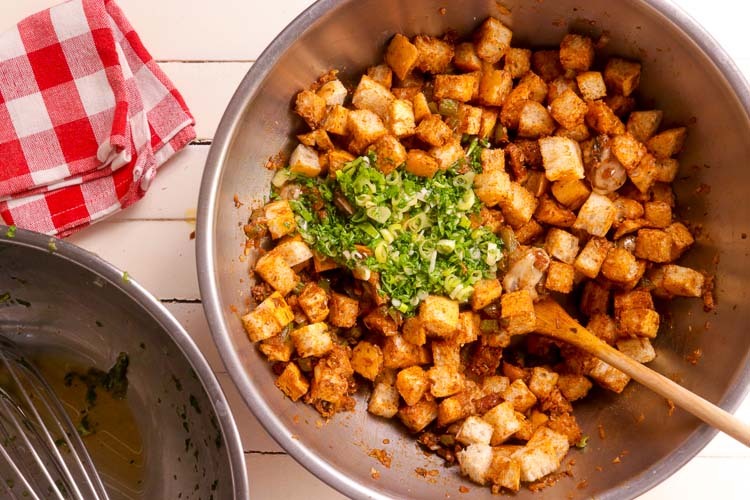 As an homage to the Thanksgiving in all its American splendor, we thought it appropriate to find a stuffing recipe from a little closer to home. Even in the US, though, “home” is really a melting pot of many different regional cuisines, so this was a prime opportunity to explore one of the more vibrant and lively ones: cajun. 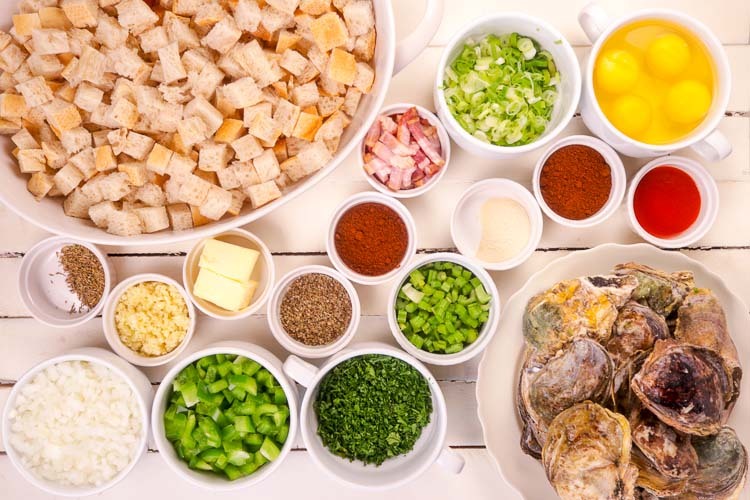 Cajun cuisine traces its roots back to the 1700’s and French-speaking inhabitants of Acadia, a province in Canada that included parts of modern-day Quebec and Maine. Following a series of wars in the region – there were 7 between 1600 and 1750 – the British in 1755 expelled any French-speaking Acadians that didn’t swear unconditional allegiance to the monarchy. Some of these Acadians eventually migrated down to Southern Louisiana, where they found their existing cooking traditions no longer worked in such a drastically different climate. What’s resulted has been a still-evolving cuisine that emphasizes simplicity and use of locally available ingredients. 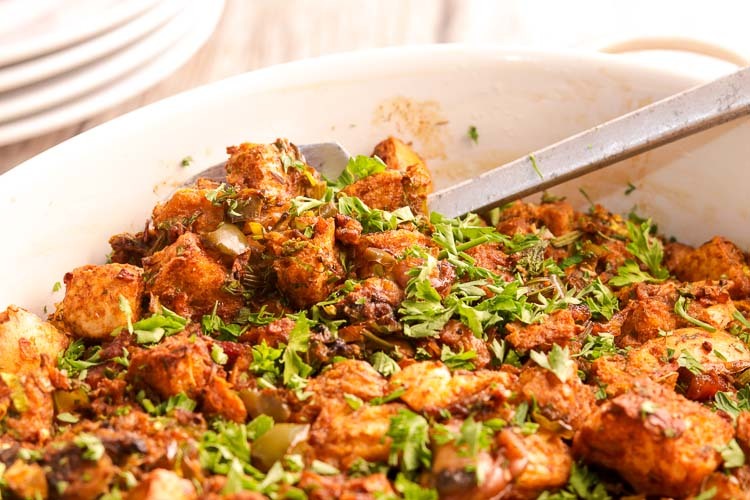 Especially in the past century, cajun cuisine has become increasingly popular for the elegance in its rustic nature. The original inspiration for the cajun stuffing recipe comes from Chef John Besh, a well-renowned chef famous for innovating on the cajun cuisine and bringing into the mainstream. 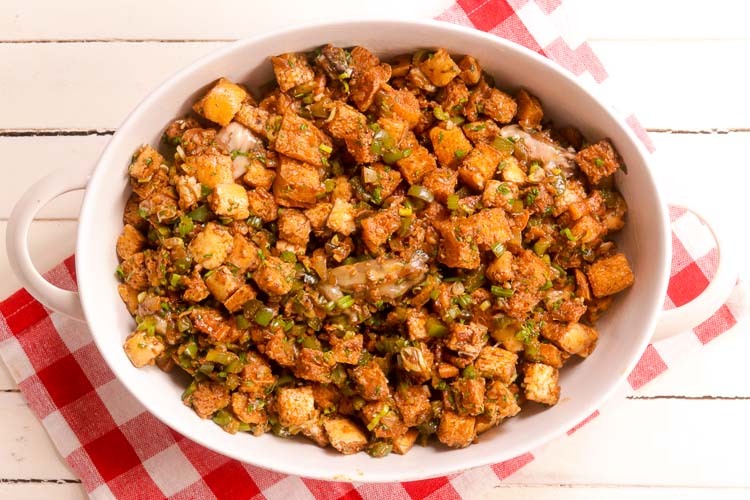 In the recipe, Besh incorporates ingredients into his stuffing that can be considered typically cajun. 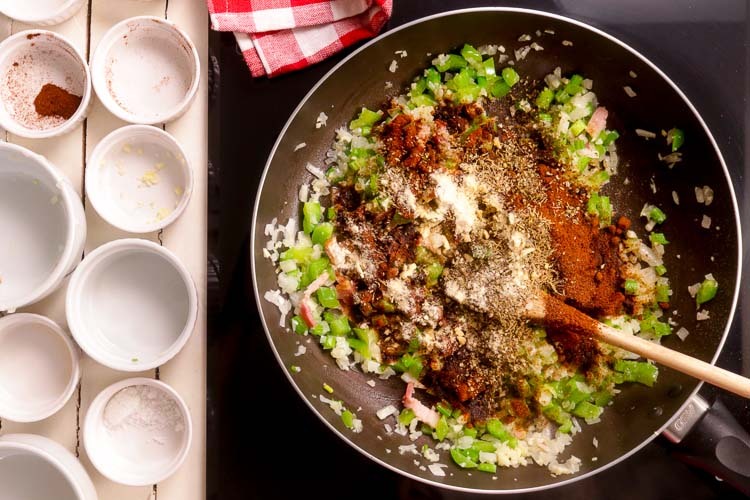 The vegetables in the stuffing – bell pepper, onions, and celery – are often called the “holy trinity of cajun cooking” and can be found as the green staple in roughly any cajun dish. Then, between his use of the Tobasco and spices like paprika and cayenne, the stuffing takes on a deep red, very cajun hue. 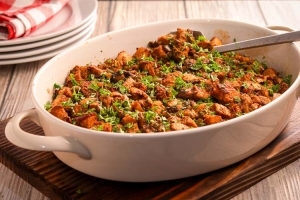 While testing this recipe, we found the original stuffing to be, however, too bread heavy with not enough emphasis on the actual cajun staples themselves. 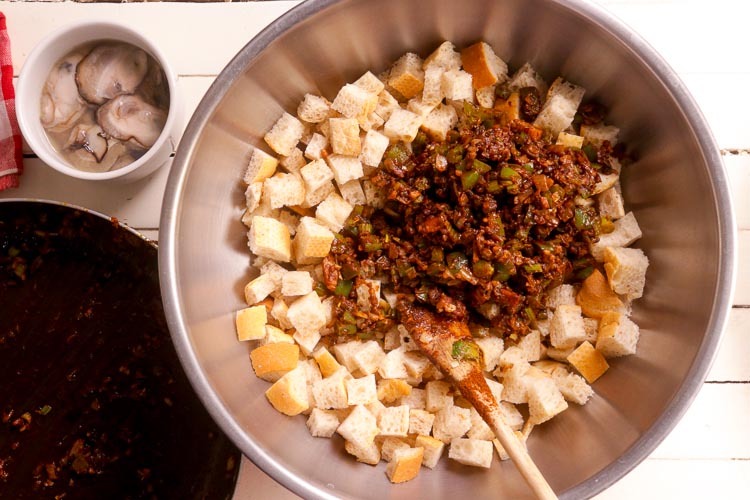 In our version, we’ve scaled back the amount of bread used and more than doubled the amount of “holy trinity vegetables” in our stuffing recipe. To give the recipe even more of a cajun flavor, we doubled the recipe’s recommendation for cayenne, added additional herbs such as thyme, oregano and saffron, and we dramatically increased the amount of garlic because, well, we love garlic that much. We also personally found the stuffing to taste much better and lighter without the bacon. This is our completely personal preference, but it certainly helps make it a healthier fare when omitting the bacon from the recipe. Nevertheless, we left it in the recipe as an optional ingredient should you choose to make it with. Other than that, the process of making the stuffing itself was pretty simple and sequential. 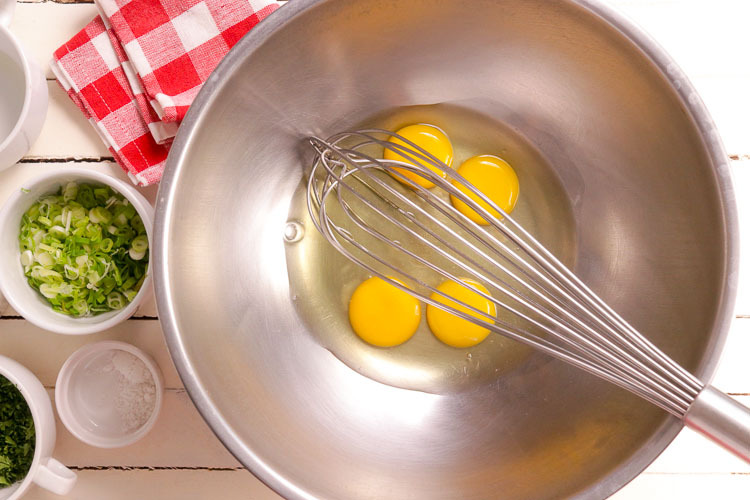 There are no time pressures or complicated moving parts in the recipe, and you can instead very calmly move from one stage to the next. The only challenge you might face is to not eat all the stuffing away before you’ve mixed the egg and baked it together! If you can make it to the baking stage with the stuffing intact, however, then this recipe will be a big hit and give you a great twist on the traditional American classic. Enjoy! What type of stuffing will you make for Thanksgiving? Comment below and let us know! 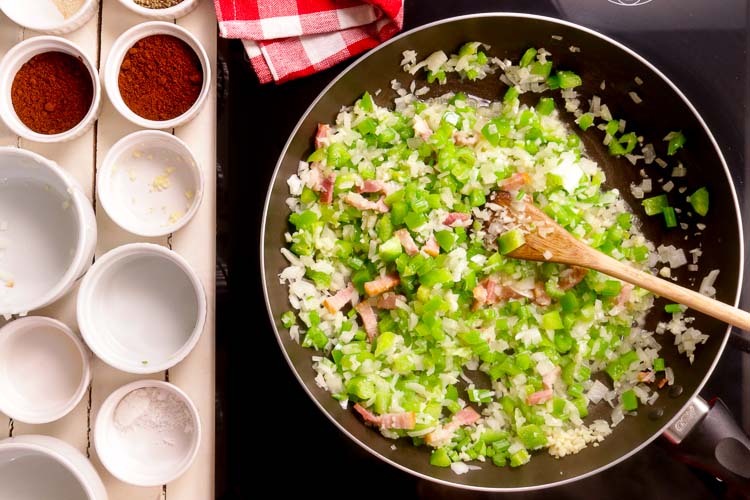 In a large skillet, add butter and then the celery, green pepper, onion and minced garlic. Cook until ingredients soften, about 6 minutes. Transfer the stuffing mixture to the baking dish and bake for about 45 minutes. The stuffing is ready as the top layer begins to get crispy and golden brown. Check on the stuffing at the 30 minute mark, if the top seems to be browning faster than the rest, place aluminum foil over the dish and then continue cooking.